Santa Barbara’s annual Goblin Regatta was a multi fleet event of about 50 boats including RS Aeros, RS Fevas, J70s, J24s, Melges, Habro 20s and PHRFs. The end of October is usually sunny and windy in Santa Barbara. However, unseasonably, we got the passage of the only rain in month in California with the wind dropping off on Sunday! Saturday was good in terms of wind, but challenging for racing which created opportunities. A total of 8 races were held, 5 on Saturday and 3 on Sunday, with 1 discard. Despite the light breeze the RS Aero racing was super competitive and there was a fair bit of jockeying of position throughout each race - even if at the end the results were the same! Positions changed and at the crossing of the finish line it was always close. Windward leeward courses were set and in the oscillating breeze choosing which side to go the on the course or just going into different zone made a difference. Overall, Payne Donaldson took the win in his first RS Aero regatta. He was always very good on the downwind legs and is a good Laser sailor who is learning the RS aero quickly. 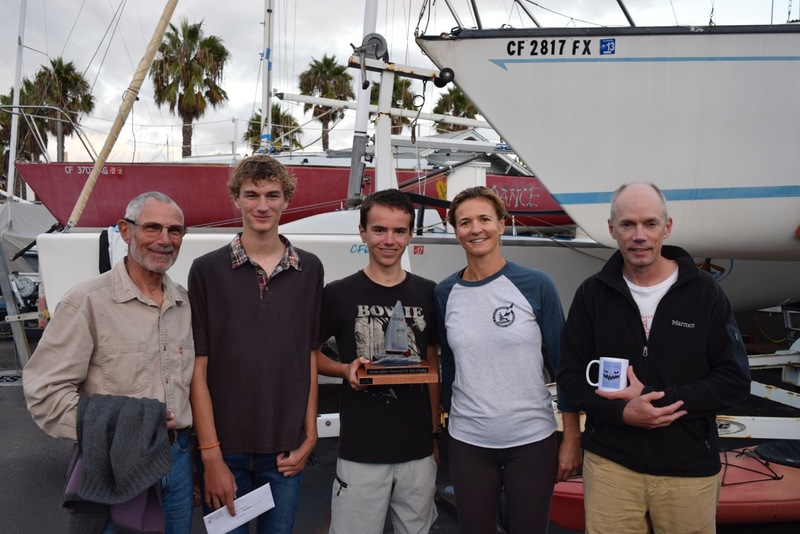 With fledgling RS Aero fleets setting up each side in San Francisco and Los Angles the Santa Barbara fleet hope to attract more Aeros next spring for their Cinco de Mayo regatta next May. The furthest travelled this year was Simeon Thomas all the way from Colorado! Several of the local fleet plan to make the trip to Europe next summer for the first RS Aero World Championship at Carnac in France late July and aim to get some good practice in California over the winter first. 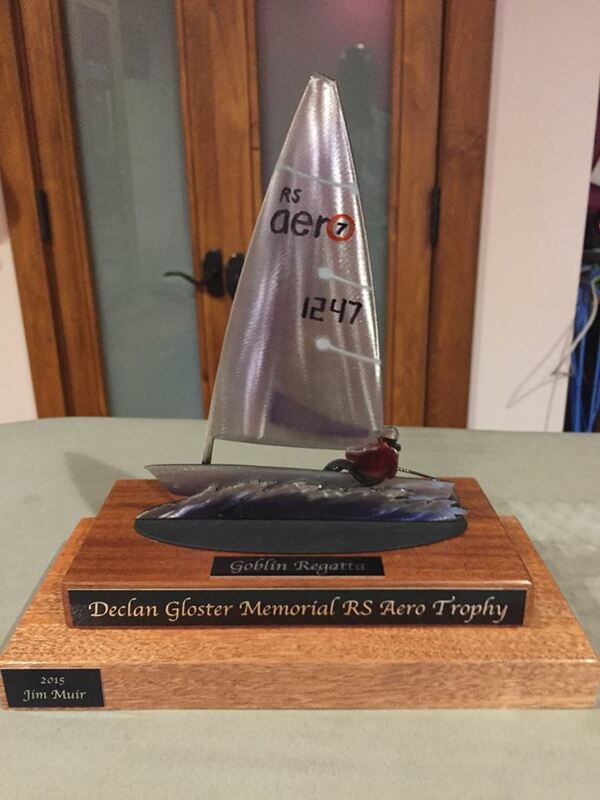 There was a wonderful new trophy awarded, a perpetual trophy in memory of Declan Gloster: The Goblin Regatta Declan Gloster Memorial RS Aero Trophy, which Payne Donaldson shall keep for the year. Declan Gloster was a young member of the keen RS Aero sailing Gloster family who was taken early by an astrocytoma cancer. Details of Declan's memorial fundraiser for cancer research into finding a cure to this deadly disease can be found HERE. The final RS Aero regatta of the season on the West Coast USA is the Corinthian YC of Seattle’s Turkey Bowl on the 19/20th November. Full details of RS Aero events in the USA can be found on the North American events page HERE. Thanks to Yannick for this nice video. In the video Yannick shows a good light wind stance, positioning himself to avoid putting his knees down on the floor.